Parking and trailhead are at the end of Shem Valley Road in Alexandria, NH (summit is in Orange). To get there, take West Shore Road off Rt. 3A in Bristol, 2.1 miles north of Rt. 104. After 1.8 miles, bear left onto Cardigan Mountain Road. Cross the Alexandria town line in 0.5 miles, where it becomes Fowler River Road. Continue for another 0.7 miles, then turn left onto North Road. When North Road ends in 1.0 mile, turn right onto Washburn Road, and then bear right onto Mount Cardigan Road in another 0.2 miles. Drive for 3.1 miles, and turn right to stay on Mount Cardigan Road (Hutchins Hill Road continues straight). Keep going 0.5 miles and stay straight onto Shem Valley Road. The AMC Hut and a large parking area are at the end of this road (1.5 miles down). Mt. Cardigan's famous rocky dome, burnt in an 1855 forest fire, provides one of the finest views south of the White Mountains. It is usually a very busy place, but for good reason. AMC maintains a large network of trails on this wonderful mountain and its sub peak Firescrew. A great loop hike which can be made over both of these peaks is described here. This loop begins at AMC's Cardigan Lodge. Note: Cardigan's slopes are home to a network of ski trails as well as of hiking trails, creating an intertwined system of summer and winter trails. To avoid confusion, AMC has marked the hiking trails with its classic brown signs and the ski trails with blue signs. Ski trails are not mentioned in this description, so just ignore any paths with blue signs. From the parking area, head out on the wide dirt path, an access to many campsites. Quickly pass Back 80 Trail on the right, then Nature Trail on the left in 0.1 miles. In another 0.2 miles, fork right onto Manning Trail, as Holt Trail (and your descent route) go left. Soon, it begins its ascent of the mountain, climbing steadily over rough terrain for one mile. After several rock scrambles, it passes through an open area known as "The Ledges", about 1.3 miles from the lodge. From this open area is a thin directional view to Mt. Kearsarge and Ragged Mountain. It also provides a look up to Mt. Cardigan's summit. 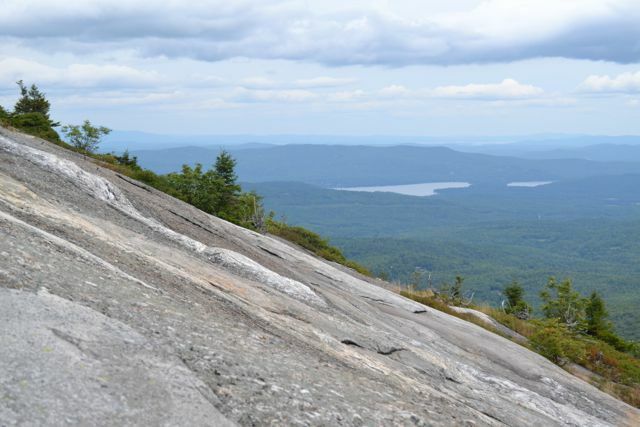 The trail soon crosses a brook, following it past a large boulder, and after another half mile of rocky climbing, emerges on open ledges with views north to the White Mountains and east to Newfound Lake. After briefly going back into the forest and scrambling steeply back out, the trail travels completely on bare rock with wide views. After over half a mile in the open, the trail passes an alpine wetland and reaches the top of Firescrew. From the summit, there are wide views of the Lakes Region. The trail ends at a T-junction with Mowglis Trail, where the true summit is just to the right. To continue to Mt. Cardigan, turn left to follow Mowglis Trail along the ridge. After a slight descent from Firescrew with views in a direction not seen from the summit, the trail winds through the boggy flat area between the two mountains, then makes a short climb over steep ledges to the summit of Mt. Cardigan, reached in 0.6 miles. From the expansive dome, the views are breathtaking. Unlike Firescrew, Cardigan bears no fir trees (only a short fire tower) to obstruct its 360-degree panorama. The far-reaching view includes the Green and White Mountains, all of the major peaks in southern New Hampshire, and many of the lakes in the Lakes Region. To finish the loop, walk to the trail sign on the southwest side of the summit and fork left onto Clark Trail as it descends steeply down the summit dome. In 0.2 miles, pass the fire warden's cabin and bear left again to stay on Clark Trail. The trail now continues moderately down through the forest and over forested ledges, reaching the limited view from PJ Ledge (a ski trail crossing) and the junction with Hurricane Gap Trail in another 0.3 miles. Continue 0.4 miles down Clark Trail, then turn left onto Holt-Clark Cutoff, also called Cathedral Forest Trail. This trail descends for 0.6 miles through the pretty Cathedral Forest, passes Vistamont Trail on the right, then continues 0.1 miles to Grand Junction. Turn right onto Holt Trail and continue easily downward, soon joining Bailey Brook. The trail crosses the brook on a wooden bridge in 0.2 miles, then descends at even easier grades for 0.4 miles, soon becoming a wide dirt path. Just after passing Nature Trail on the right, rejoin with Manning Trail and walk an easy 0.3 miles back to the parking area the way you came.